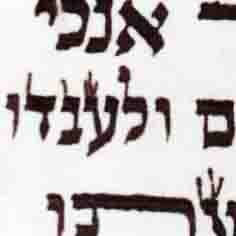 A pencil mark, left by a careless magiha, inside the bottom left space of a chaf pshuta. Permissable to erase or no? Megillah yes. 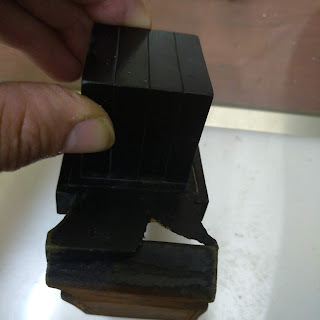 Tefillin or Mezzuzah, no. It is Chok Tochot. See the Mishnah Berrurah on O"H 32:17.
there are that permit to erase if it obvious not dyo and the caf is clear - not a hay. this question may need more clarification and a shaylas rav. I remember the mishnah berurah as permitting then quoting the pri megadim as a machmir but why would it make a difference whether or not the caf is clearly not a heh and not be solely talui on whether the pencil mark is dyo or not? Why would chak tochot apply any less to a megilla? Chok Tochot is not a problem regarding a megillah unless it is Rov HaMegillah. A single letter, not an issue. R' Michael, I would still venture to say that it should not be done lechatchila. Secondly (and I'm not sure on this point so your input is appreciated) - perhaps chak tochot is a different halacha than that of chaser v'yeter. Chaser v'yeter (or another type of psul) it is clearly apparent when an inyan or rov is pasul or missing. However chak tochot, how would someone know if potentially half or most or the beginning was done through chak tochot? This being the case perhaps with chak tochot the halacha would be different, since it's impossible to discern? Chaser or Yeter Ot would make the Megillah Possul. The Yeriat Shlomo rules(in the name of the Kol Yaakov 691:9, Birkei Yosef 691:2 Kesset HaSofer 28 Liskat Sofer S"K 2 Pri Megadim 691:1 and several others) that so long as the majority of the megillah was written k'din there is no choshesh of chok tochot in a megillah. Rav Ovadia Yosef in Chazon Ovadia p 245 says specifically that Chok Tochot may be done l'chatchila as tikun on a megilla. 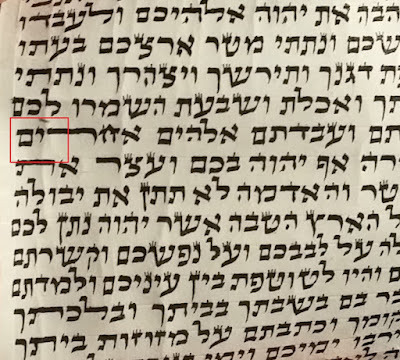 Now regarding a pencil mark, if it is the size of a regel of a yud of the same writing, it doesn't matter color or shade it is a possul that cannot be fixed by erasing just the pagum. Chaser veyeter should have the same din as a psul in tzurat haot or chak tochot...no? Interesting on R Ovadia being machshir even lechatchila. What's the svara? In a Megillah, not according to the sources quoted. A chaser or a yeter is a posul. If up to half the megillah was written by means of chok tochot it is still kosher. As far as Rav Ovadiah's savara, I try not to boil down his teshuvot into anything that will fit into a blogger comment box. I've subsequently found in chayei Aryeh (O"C Siman 8) who clearly is machshir specifically speaking about chak tochot as well as any other psul in a megilla, even though there's a svara (and indeed some hold this way) that a Psul is worse than chaser veyeter and is not kosher. This is also obvious because a megilla is only kosher if Pasul in this way if already read or if a kosher one isn't available (MB 691:14)! Certainly lechatchila it is not good even for keriy'a! 2) is there not a svara that davka chak tochot is different because it cannot be distinguished and therefore one wouldn't know if most or a whole inyan was Pasul?